British speaker manufacturer Q Acoustics has taken the wraps off its all-new 3000i loudspeaker series. 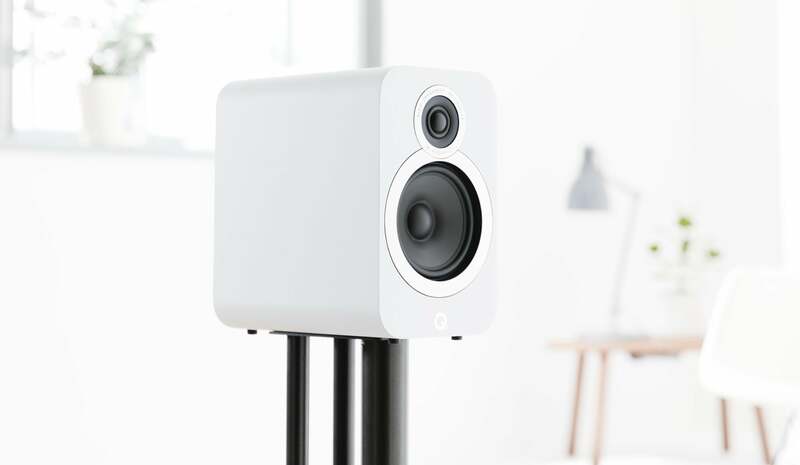 The company says the new lineup builds on the success of its original 3000 speaker series and features innovative audio and design technologies taken from its $6,000 flagship, the Concept 500. I had a chance to audition the new lineup first hand and left favorably impressed with the price/performance ratio on offer. At first listen, it looks like Q Acoustics has once again delivered bona fide hi-fi performance at mainstream price points. The three models target varying budgets and living-space constraints: The compact 3010i, mid-sized 3020i bookshelf, and floor-standing 3050i. 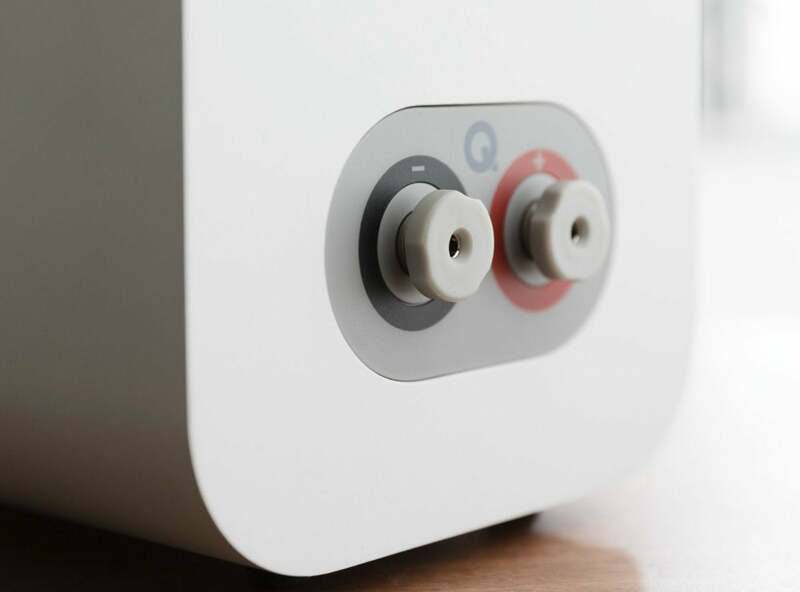 Q Acoustics also announced the 3090Ci center channel and Q3060S subwoofer for home theater applications, but those weren't available during the demo. Sometimes when companies come out with updates to their products, you’re hard-pressed to figure out what those updates are and what they do. That's certainly not the case here, there are lots of evident changes inside and out. The line comes in four finishes: Graphite Grey, English Walnut, Carbon Black, and Arctic White. Unlike the previous series, buyers won't need to pay extra for any of them. Q Acoustics helpfully brought along samples of the original 3000 series, so I could make direct comparisons. The new finishes are a significant improvement. Chrome accents around each driver imbue the 3000i series with a stylish flair. The finish now comes edge to edge, adding refinement to the speakers' looks. Chrome accents around each driver add a stylish flair when you see them with their magnetic grills removed. 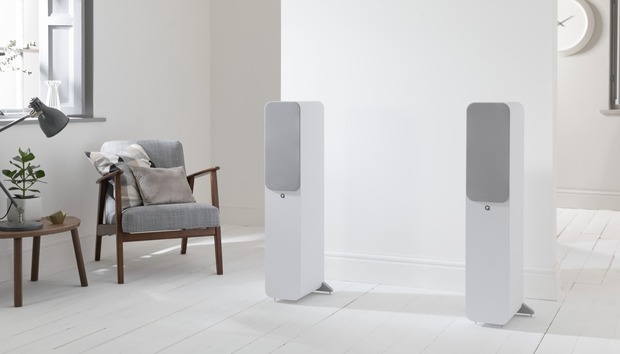 A Q Acoustics representative told me the 3000i range includes point-to-point internal bracing, construction first employed in the company’s top-of-the-line Concept 500 floorstanding speakers. The intent is to eliminate the vibration-induced cabinet resonance that can color a speaker's sonic reproduction. The 3000i speakers feature internal supports at key junctures as indicated by computer analysis. But it's not just the cabinet design that helps reduce resonances. The soft-dome tweeter is decoupled from the baffle via a suspension system to isolate it from the woofer. The 3000i’s binding posts are brand new and a significant improvement over the previous generation. 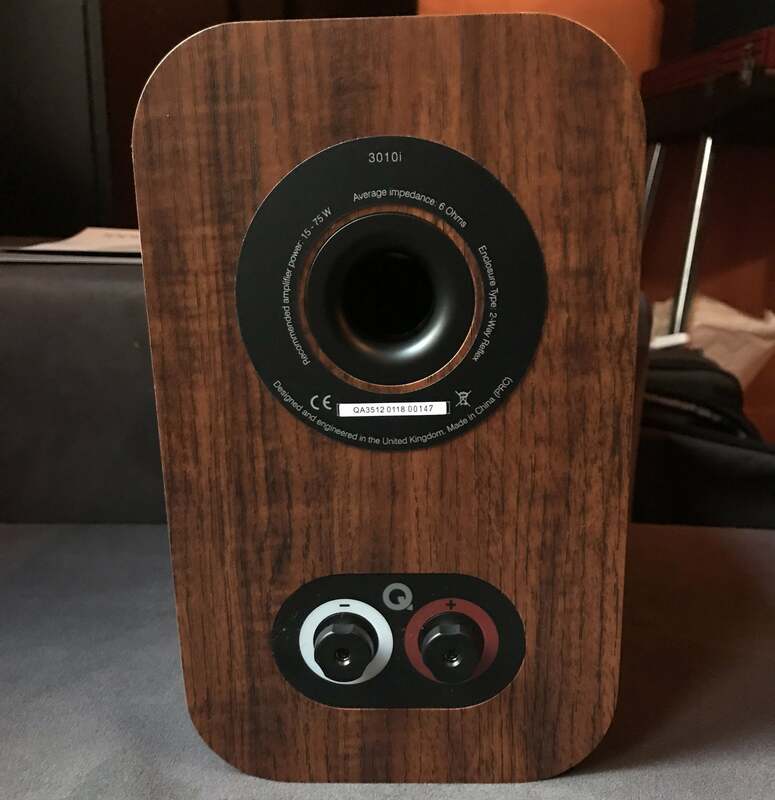 Speakers with low-profile binding posts have a huge drawback: banana plugs stick half way out from the back of the enclosure. The original 3000 series employed an awkward, angled binding post to alleviate the problem. The 3000i series’ binding posts are recessed into the cabinet, so that banana plugs practically disappear inside. The speaker's low-profile five-way binding posts allow you to insert banana plugs fully into the cabinet. The most obvious difference between the old and new series, however, is the size. The cabinets for the 3010i and 3020i bookshelf models are slightly taller and 25-percent deeper than the previous generation. 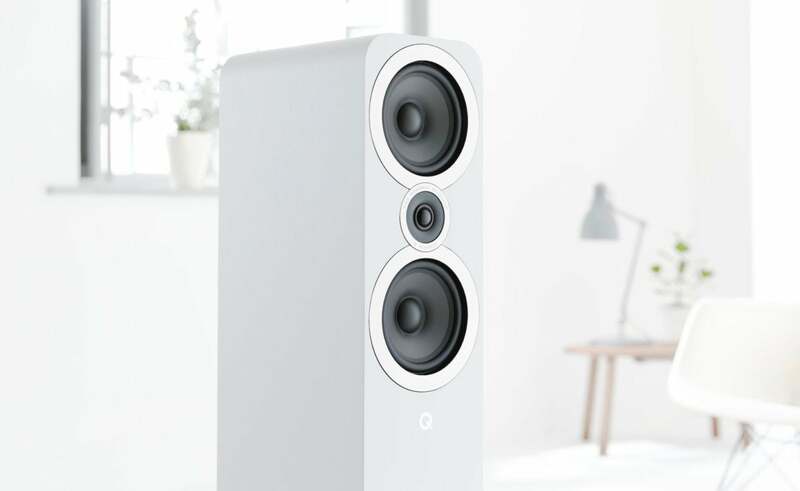 Q Acoustics says the increased physical volume extends low-end frequencies for a more powerful bass that belies the speakers’ diminutive size. After listening to them during the demo, I must agree. Detail view of the new binding posts. The 3010i is a compact speaker that’s perfect for a bookshelf, countertop, or anywhere you want high performance from a small footprint. Priced at $250 a pair, the 3010i is a two-way reflex speaker with a 4-inch bass driver and a 0.9-inch tweeter crossed over at 2.6kHz. Frequency response is rated at 65Hz to 30kHz (+3dB, -6dB). Each speaker weighs 9 pounds and measures 5.9 inches x 10 inches x 9.9 inches. I was shocked by this speaker's performance considering its size and price tag. 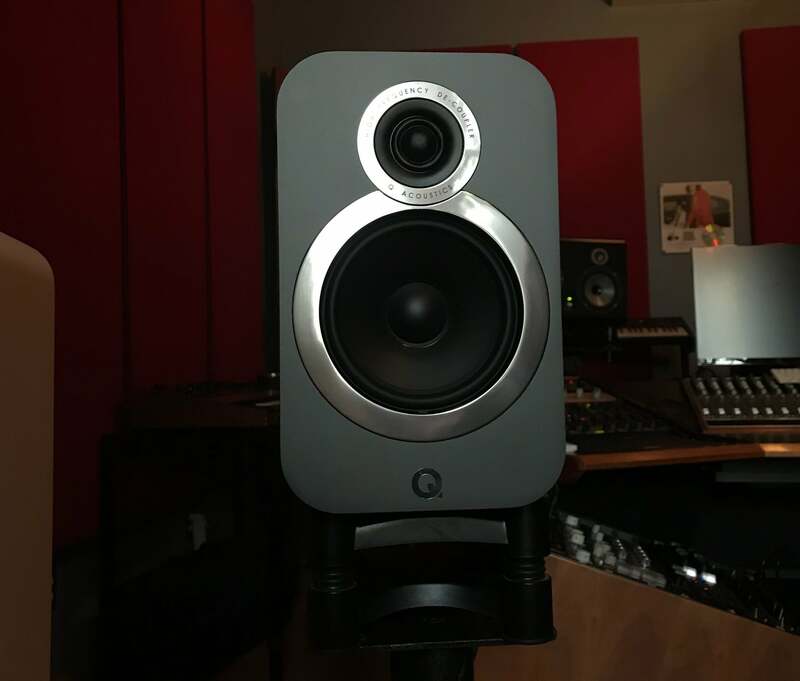 The mid-sized 3020i speaker weighs in at 12 pounds and is priced at $300 for the pair. The 3020i sports a larger, 5-inch driver, but retains the same 0.9-inch tweeter. The tweeter and driver are crossed over at 2.4kHz, with a frequency response of 64Hz to 30kHz. The 3020i should serve equally well as a stereo pair or as part of a surround-sound setup for a home theater. The 3050i floor-stander is the 3000i series' flagship. 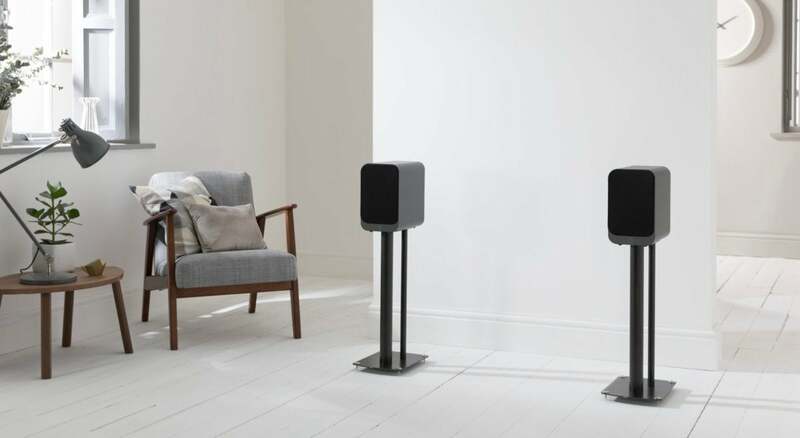 Priced at $800 for the pair, the 3050i weigh in at 39.2 pounds each and measure 12.2-inches x 40.2-inches x 12.2-inches. An MTM-design arranges the drivers in a midrange, tweeter, midrange configuration. The twin midrange drivers are 6.5 inches in diameter and the tweeter is the same 0.9 inches as the other speakers in the lineup. The woofers are crossed over to the tweeter at 2.5kHz. Unsurprisingly, the 3050i delivers the deepest bass of the three models, with a rated frequency response of 44Hz-30kHz. Tall loudspeakers can be susceptible to increased internal pressure caused by standing waves. To address the unwanted resonance, the 3050i employees a Helmholtz Pressure Equalizer tube inside the cabinet, which evens out the cabinet’s internal pressure. The 3050i has an MTM driver arrangement. I had a chance to sample all three models, fed by a Naim music server playing tracks from Tidal. In short, at first listen, the 3000i series promises to deliver the outstanding sonic value that Q Acoustics has become known for. We'll be doing a full, hands-on review of some of the 3000i models in the near future. The new 3000i lineup is available now in the U.K., with the 3010i, 3020i, and 3050i scheduled to ship in the second week in May for U.S. customers. U.S. customers won’t be able to get a hold of the accompanying center channel and subwoofer models until summer.